The U.S. military said Thursday it was paying $112,000 in compensation to victims of a traffic accident involving an American cargo truck that sparked the deadliest riot in Kabul in years. A statement issued by the military said the payments for 24 claims of property and personal damage related to the May 29 traffic accident demonstrated the U.S. government's "commitment to responsibility and accountability for the actions of U.S. armed forces." The military truck, which apparently suffered a brake failure, rammed into cars at an intersection in the Afghan capital on May 29, killing at least one person and injuring others. In the subsequent rioting, hundreds of people rampaged through the city screaming "Death to America!" and causing widespread destruction. 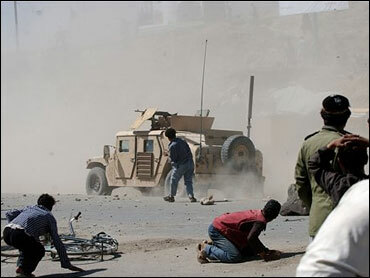 About 20 people were killed, many apparently from gunfire by Afghan security forces. The Afghan parliament later passed a nonbinding resolution calling for the U.S. troops involved in the crash to be prosecuted in Afghanistan, but U.S. officials say the United States and Afghanistan have an agreement that excludes U.S. soldiers from being prosecuted locally. The military statement said findings of an accident investigation report by the U.S. military and Afghan government would likely be publicly released in August. The U.S. military had accepted 26 claims for compensatory damages for the traffic accident under the Foreign Claims Act, the statement said. Some 14 claims had been settled and 10 others had been approved awaiting payment — in total $112,651. Two claims were denied but could be resubmitted with new documentation of losses, it said. "We are guests of the Afghan government and their people, and we take responsibility when our actions cause harm to Afghans," said U.S. military spokesman Lt. Col. Paul Fitzpatrick was quoted as saying. "This accident gained much public attention because of the violence that later ensued, so its very important we are open and frank on this matter to retain the trust of the Afghan people."